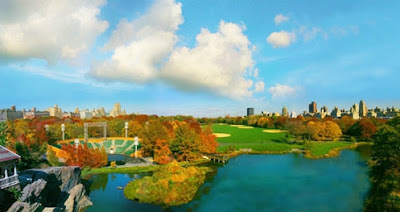 The view of New York’s Central Park from 17 stories high is incredible. For a brief moment the scenery calms my nerves as I dress for the most important appointment of my career. All of us have attended meetings where it seems the world’s fate will be determined. Well, my little world is up for discussion this morning. Pressing the last wrinkle out of my blue oxford shirt, I relentlessly switch from one television station to another, searching for anything to pull my thoughts back from anxiety. On the screen appears a little dishwater-blonde girl. In a small voice, she describes how she eats just once a day, often receiving that single meal because her parents have gone without to ensure she has at least something in her tummy. Her mother holds a stunted, palm-sized watermelon and explains that the family's only recourse is to survive on the sickly fruits and vegetables gleaned from their dreary garden—or to have no food at all. Their weather-beaten trailer is located in the backwoods of Kentucky. Larry Jones, president of Feed the Children, directs the organization's cameras into the family's home. Their life is encapsulated in a few camera angles, appraised in mere seconds. This artful presentation concentrates on the little girl as she opens a kitchen cupboard door attached to its frame by a single screw. Countless cockroaches scatter from the light, leaving the cabinet bare except for a sole bag of flour. Overwhelmed with compassion, I sit down on a lavish leather chair inside my $350-a-night hotel room. My eyes begin to swell with tears. Next, Larry’s wife, Frances, introduces me to a shirtless boy who opens his lips wide to show his blackened, cavity-riddled mouth. He points to each pain-stricken area, saying, "It hurts here and it hurts here, and here." My heart seems to double in size within my chest as I weep uncontrollably. Even now, writing this to you, I cannot restrain my emotions. Have you ever been truly hungry, uncertain of your next meal? Hunger consumes the mind and pierces through you as sharp as knives . . . it challenges the best of souls. Imagine being a hungry child, wondering when your next meal will be, while plagued by fear for your parents' well-being. Now imagine what it's like to travel just a few minutes away and see enormous wealth, other children laughing and playing with full stomachs and nice clothing. This is reality. It's not the Third World; it's our world, our country, our state, our community, and our neighborhood. Compelled, I reach for the phone to dial the number on the television screen. My mind quickly calculates the cost of my clothing; redirected, that money could feed four children for six months. Humbly, I dial. The woman on the line senses my emotional turmoil and gently poses a few questions. Reciting my credit card number, my voice cracks with every single digit. Gasping for air, it’s difficult to breathe . . . compassion has knocked the wind out of me. “Thank you” were the only words I could muster as the call ended. As I hang up the phone my mind’s eye is still focused on the hungry little girl and the cavity-plagued boy. Tears stream down my face and I realize how incredibly fortunate I am. In a New York minute my little world has collided with reality, and today's "important" meeting suddenly, unexpectedly, warrants a new perspective. Something profound is happening inside of me. It’s the arrival of peace and it comes to transform my spirit . . . to capture my thoughts with a vision of great purpose. The prize of peace is a life view more spectacular than the one from my balcony and its reward comes each time our focus turns outward. Suddenly, I notice the paralyzing sting of anxiety from a few minutes ago is gone. My "most important" day concluded as one of my best days. Events like these are gifts. Embrace and cherish them as new opportunities to make positive change in your life. The next time anxiety invades your spirit, embrace this truth . . . the room in your heart always provides the best view.